Conventional subdivisions in Australia prioritise motorised vehicles over other forms of transport. At the Witchcliffe Ecovillage, walking and cycling have been recognised as the healthiest human movements–healthy for people and healthier for the planet. Dedicated path networks which link all houses and community gardens to each other and to the Village Square will mean that residents and visitors can safely traverse the whole village by bicycle or on foot (or by wheelchair or pram) through beautifully landscaped gardens, with minimal interaction with cars. 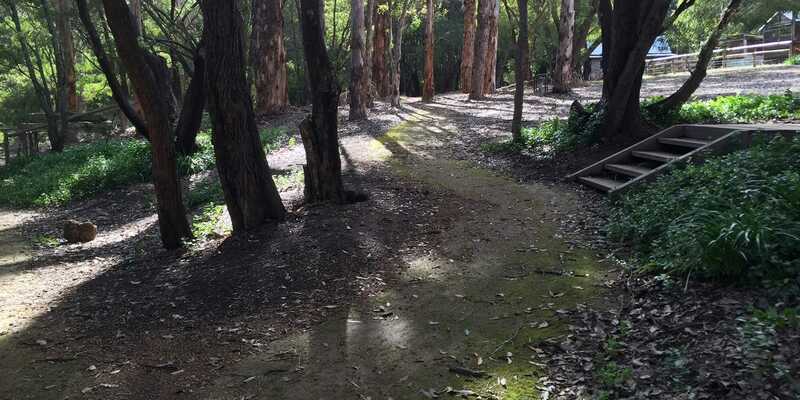 Witchcliffe is linked to Margaret River via Bussell Hwy, a quick 10 minute drive, but it is also connected to Margaret River and beyond by the beautiful Wadandi Trail, a bushland bike and pedestrian path that follows the old forestry railway tracks. Cycling to Margaret River along the Wadandi Trail is an easy 45 minute ride, with access to tourists attractions like Leeuwin Estate, Yahava and Amaze’n along the way. The Wadandi Trail is proposed to eventually extend from Busselton all the way to Augusta. The primary movement network in the Witchcliffe Ecovillage is the path network. Paths link each household from their front door within the community garden to the Village Centre. The maximum distance from any house to the village centre from the north is 500m, and from the south, 750m. The path network is built away from roads through the community gardens to provide the most efficient and enjoyable way of accessing friends and neighbours within and between clusters, the village centre, recreational facilities, the Witchcliffe town centre, and agricultural land around the village. The path network will also link directly to school bus dispatch points and the Wadandi Track, which provides a safe and convenient route, away from the highway for cycling to and from Margaret River and the wider region. With electric assisted bikes becoming better, cheaper and more commonly available, cycling and the excellent path network within the Witchcliffe Ecovillage will become more accessible to people of all fitness levels and physical ability. Paths in the Witchcliffe Ecovillage will be built from stabilised gravel to provide the convenience of a sealed surface while maintaining the character and feel of a rural village. In addition to the path network that will link the residential clusters to the village centre, extensive recreational trails will surround the residential zone, providing a safe, scenic exercise path through the hedgerows, woodlots and buffer for walkers, joggers and bike riders. Road access will be provided to the Witchcliffe Ecovillage from Bussell Hwy, with an internal road network providing access to parking areas within the village centre and connecting to every household. There are two intersections onto Bussell Highway that have been located in consultation with the Augusta Margaret River Shire and Main Roads to provide vehicle access to the northern and southern areas of the Ecovillage. Internally, the northern and southern stages of the Ecovillage will be connected via a scenic bridge over the central dam. The intersection layouts are based on Main Roads’ requirements; however, our goal will be to minimise the size and scale of intersections as much as possible to promote lower vehicle speeds and pedestrian amenity.